You might have heard the saying that goes something like “Life is a journey.” While some attribute it to Ralph Waldo Emerson, others say it may have come from a text written in 1855. But no matter the source, the idea is life is a series of stops meant to be enjoyed for a while and then left for the next adventure. For Gary Leonard who has spent much of his life on the road as an RK Black field service technician driving between client locations maintaining and repairing office equipment, life has very much been a journey, and it's now time to set course for a new destination. 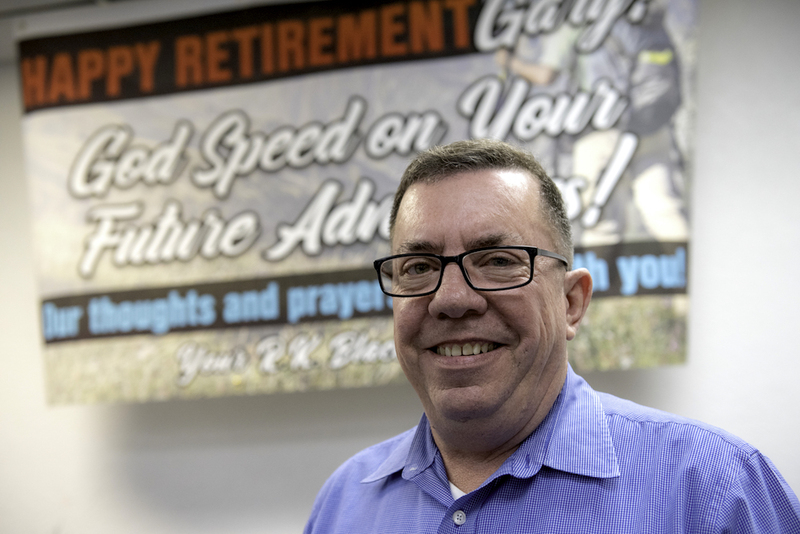 Today, after more than 34-and-a-half years of service, the now field service manager is retiring and is — quite literally —heading out onto new roads to see new sights and experience new things. “I’ve got a vacation planner lined up that’s going to take the next five years,” Gary pronounced excitedly with a bright smile. His travel plan, drafted with the help of his granchildren, includes many sites throughout the States, cameras in hand and, for some of the trips, grandchildren at his side. Among the destinations are places in Colorado, Montana, Florida, Tennessee and the Grand Canyon, with a goal to photograph as many landscapes and animals as he can. “On all these trips we’re going to be fossil hunting and things like that,” said Gary. This will not be the first time Gary has travelled far. A Texas native, after the third grade Gary moved to Moore, Oklahoma where he grew up. After starting college and working in the oil field installing blow-out preventers, he joined the United States Air Force. There he served for four years, two of which he spent in Okinawa, Japan, working as an F-15 avionics specialist. Repairing and maintaining microfilm machines is what Gary did until some years later microfilm started giving away to newer technologies. It was then when Gary transitioned to working on HP printers and faxes, and eventually became a color specialist. Asked what kept him at RK Black all these years, Gary answered how he enjoyed getting out of the office and meeting people. But also, he spoke of the company’s culture, how there is prayer at company meetings and how client care is so highly regarded at RK Black. He recalled how when he first started at RK Black, Chris Black was taking over as president as Bob Black, Chris’s father and the founder of the company, began stepping down. Gary said during this time occasionally Bob would go with Gary on service calls to client locations and after completing that call would review with him what he could have done better. He said these ride-alongs, though a bit uncomfortable at first, helped him grow into being a better technician and to provide better client care. “I don’t know,” Gary remembered saying, thinking then with all the work he did, he had left the machine practically shining. Bob would then go on to tell him there was a fax machine in that office and that that was a sales lead. “There was so much stuff he would tell me back then with the meetings we would have,” said Gary. It's all about caring: Same journey. Different road. Gary said after all these years he has mixed feelings about retiring, especially as he sees the company really starting to grow. “Go to the zoo, taking dad to Texas, camping at Blue River and who knows from there,” said Gary, listing off his planned adventures for the first few weeks of retirement. Gary said the success of his last five years as field service manager he credits to his team of service technicians. "They busted their butts and I just want to give kudos to them." That caring heart that kept Gary at RK Black for so long caring for clients is the same heart carrying him to paths where he can spend more time with his family and care for others — all while making new adventures and memories. Gary came to RK Black while looking for what he was going to do for the rest of his life. It would probably be safe to say that he did find what he sought: All he wanted was to care for people. And that is what he did ... and will continue to do. Happy trails and adventures, Gary! Keep in touch and send us pictures!